Elite media often blur distinctions between right-wing populism and progressive populism — as though there’s not all that much difference between appealing to xenophobia and racism on the one hand and appealing for social justice and humanistic solidarity on the other. Meanwhile, liberal Times columnist Paul Krugman (whose idea of a good political time is Hillary Clinton) keeps propounding a stand-on-head formula for social change — a kind of trickle-down theory of political power, in which “happy dreams” must yield to “hard thinking,” a euphemism for crackpot realism. 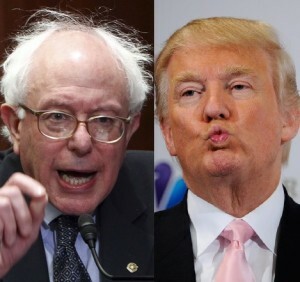 “When pollsters match Sanders against the four top-polling Republican hopefuls, on average he does better than Clinton does against each of them — even though she, like Bush, is supposed to be ‘best positioned’ to ‘capture the broad, sensible center,’ according to the Tribune.